This past week I’ve been digging back into the Caravel, in an attempt to get it back in fully-functioning condition by mid-November. You might remember that last February I was working on that project, and abandoned it because I had to switch over to working on the Safari. Those Safari projects (re-flooring, building new cabinetry, etc.) took all spring, and then we went on the road in May. Now that it’s fall and we are back at home base, I’ve finally got a chance to finish the plumbing. Actually there were three general areas of work to be done on the Caravel, of which the plumbing was only one. I also started building a new dinette table to replace the heavy one we have been using, and there was the super-annoying propane regulator job that morphed into complete replacement of the regulator, hoses, mounting bracket, and hitch jack. I hate calling tradesmen, because (a) it’s hard to find a good one; (b) few of them return calls; (c) even fewer will actually show up. My historical success rate has been to get one good worker for every five or six calls. So I was geared up for the worst when I started seeking a mobile welder to come over, but got lucky this time and got a guy with only four calls. One other said he would come over “next week,” but that was in July. John showed up and right off the bat I could see he was very experienced. Over the phone it took 30 seconds to describe the job, and since he owns a travel trailer himself he knew exactly what was necessary. He got the jack out in 20 minutes, and the new one went in pretty quickly too. It is bolted in place, not welded, so I can get it out myself next time. 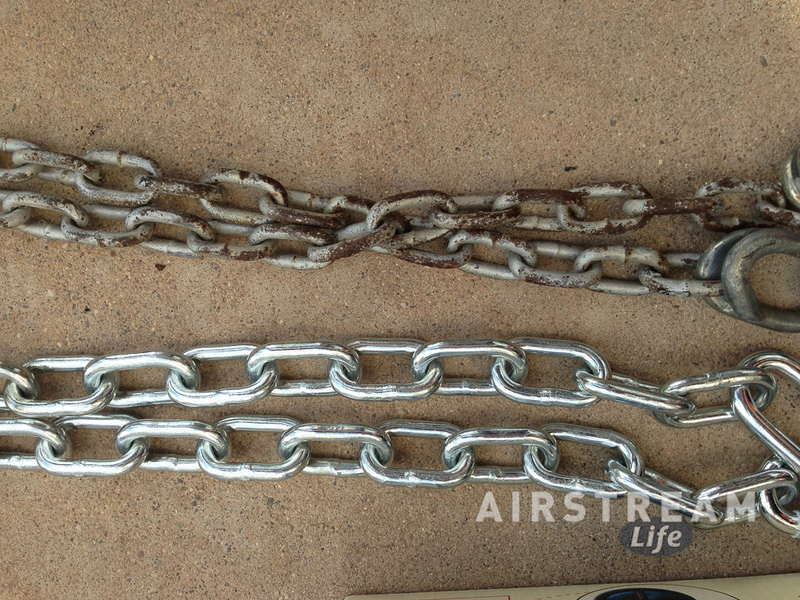 While we were at it, John torched off the old—completely inadequate— safety chains and welded up a new set. The whole job took about an hour, plus a few minutes the next day for me to wire up the power leads. I left the plumbing in what I earlier described as an “80%” state. This turned out to be pretty close to the truth, as long as you remember that the last 20% takes 80% of the time. I was hoping to complete the job in about 10 hours. After a week of tinkering with it, I think I’ve already using up my allotment of time. Don’t ever re-use anything from the original plumbing. 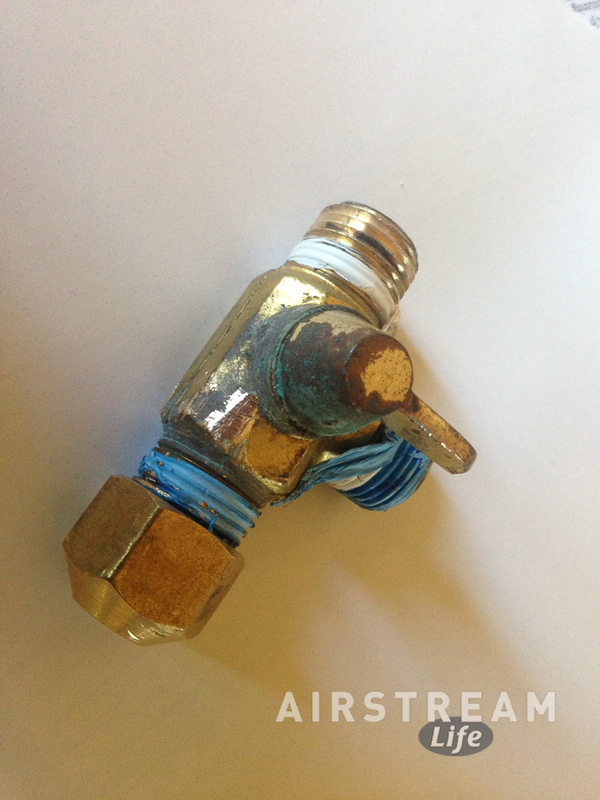 I had set out to avoid that mistake (see photo below of some of the old plumbing I threw out), but then I went and re-used just one piece, a brass winterization valve that was screwed into the water heater, because it was so firmly stuck in the threads that I couldn’t get it out. And guess what piece leaked when time came to pressure-test the system? Buy good quality parts. I can’t see any way that it pays to buy cheap plumbing fittings. All the stuff I removed was low-grade and it was all failing after a decade. You need a LOT more of everything than you think. I bought 100 feet each of blue and red PEX tubing, 100 crimp rings, eight swivel fittings, a box of brass elbows, six shutoff valves, and many other bits. I ran out of swivel fittings, crimp rings, and shutoffs, and nearly ran out of elbows. Why? Because I didn’t realize exactly what was going to be required (and I wasted a lot of crimp rings making mistakes). 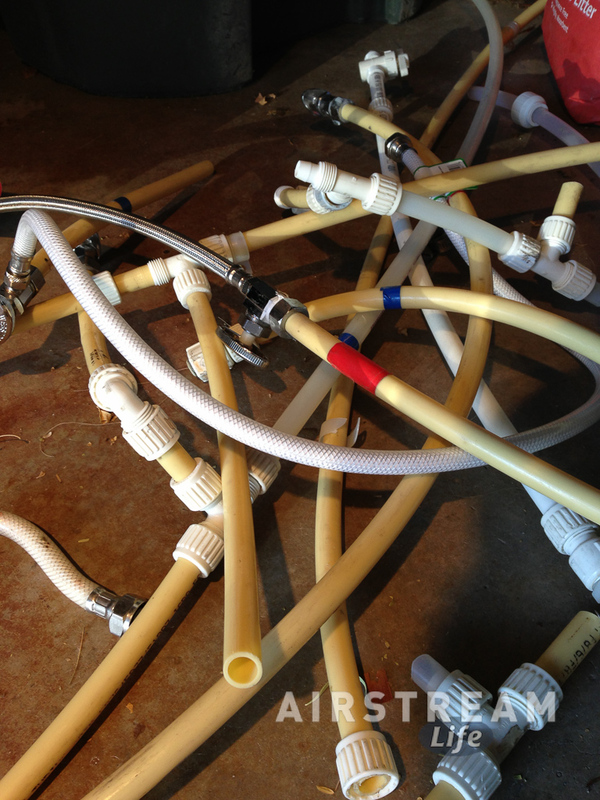 It’s astonishing to me that I used most of the 200 feet of PEX tubing that I bought. It’s only a 17-foot trailer, for cryin’ out loud! It’s a lot easier to re-plumb if the cabinetry is out. 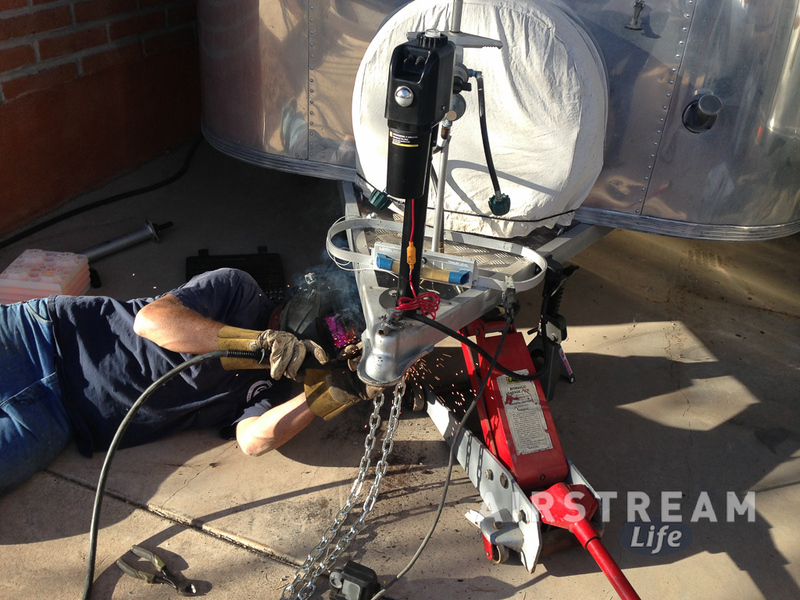 I would have had this job done in a fraction of the time if the trailer were bare, instead of fighting to crimp copper rings inside a closet! The job still isn’t done, but it’s getting close. Eleanor has been squeezing herself into the closets and under-sink area to do some of the tricky crimps. We spent most of last Saturday together in there, and we may yet spend a chunk of this coming Saturday in there too. The plumbing is fully assembled, so the next job is to do more leak-testing, re-assemble the interior furniture that we removed, clean up, and then in a few weeks we’ll take the Caravel out for a road test and shakedown weekend. The third project, the dinette table, can wait until later.